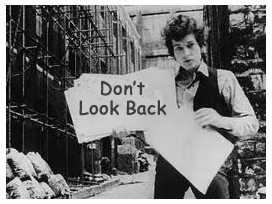 Keep looking forward—looking back is a trap. Plus it’s not in your DNA. You’re an artist, an entrepreneur, looking back only gives you heartache. Why? Because your job is to look forward, into a NON-EXISTENT future—a future that we depend on YOU to create and manifest for us. A future filled with great songs, exceptional soundtracks, inspiring stories, moving speeches, phenomenal movies, encouraging books, award winning screenplays, unique sculpture, expressive paintings, breathtaking architecture, eye-popping websites and jaw dropping mobile apps. We’re certainly not depending on our leaders for that! We’re depending on YOU, the artist, designer, songwriter, scriptwriter, musician, author, director, producer, and courageous CEO. You chose the path of the lone creative warrior and it’s your responsibility to create, manifest and contribute your art & enterprise for the benefit of all of us! We’re counting on you, the crazy, creative genius, to lead us into the coming year. Do you accept the challenge?